TNR -- TV News and Reviews: Chuck Two Hour Premiere Tonight! Chuck Two Hour Premiere Tonight! Just wanted to pop a quick reminder in here for Chuck fans--the 2-hour Chuck premiere is tonight at 9/8c on NBC. I'm not exactly sure why Chuck is premiering on a Sunday. I only found out it was on by checking out the online TV listings yesterday, out of curiosity about this weekend's TV offerings. Tonight we'll see what happens with Chuck and his new mad super-spy skillz, and after the 2-hour premiere we won't have long to wait to see what happens next. Another new Chuck episode airs tomorrow, Monday at 8/7c. 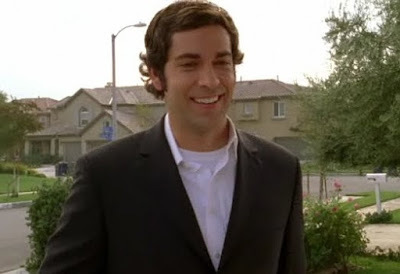 PHOTO: Zachari Levi as Chuck, screencap c2009 NBC. not quite sure why it premiered on Sunday, let alone for 2 hours. They couldn't wait a day? I was watching the Simpsons and Cleveland Show instead, burt I'll catch Chuck tonight and on-line when I get the chance. I've heard it wasn't bad, but I'll have to see for myself. Seems like they're jumping the shark by making him an actual shark, y'know? Cake Boss -- "Apples, Arguments, & Animal Prints"
Doctor Who -- "The End of Time"